The Solution File Navigator provides quick access to every file within the solution. Open files without having to search them in the Solution Explorer. Optimized search algorithms make it possible to find each file as fast as possible with the help of substrings of a file name or acronyms (Camel Case Notation). Files can be opened in the editor or located in the Solution Explorer of Visual Studio. The Solution Symbol Navigator improves the search for source code within the solution. Instantly find classes, structures, methods, properties, fields, and more. Accelerated search process using substrings or acronyms (Camel Case Notation). 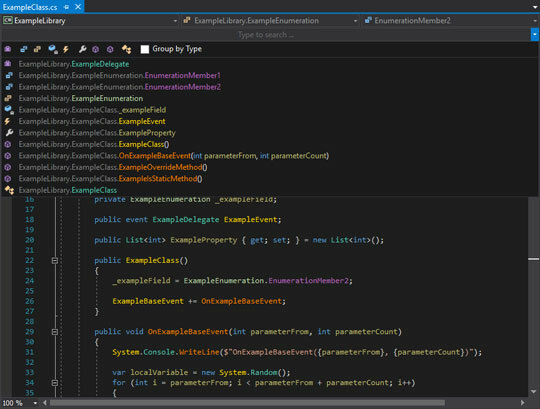 Jump to the position of the code element within the editor or locate the containing file in the Solution Explorer of Visual Studio. The Symbol Search Bar extends the navigation within the Visual Studio Editor. It makes it possible to search for symbols within the editor and offers the possibility to jump directly to their position. Using substrings or acronyms (Camel Case Notation) speeds up the search process.